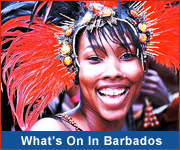 Barbados nightlife - nightclubs, dinner shows, romantic dining and more! When the sun goes down in Barbados, the fun continues! Barbados nightlife is extensive and varied, providing entertainment for every taste, from historic dinner shows to romantic cruises and exquisite dining. If you really enjoy nightlife and partying, stay at any of these hotels, resorts and vacation rentals in and around St.Lawrence Gap to be near the heart of the action! Enjoy a romantic cruise along the coast of Barbados with the one you love, watching the starlit sky on a cloudless night! 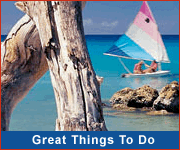 You can join a scheduled cruise or charter a catamaran for a private evening for two! Or how about an underwater exploration of reefs & wrecks by night on a real submarine? Enjoy the once in a lifetime experience of a romantic night-time escapade to the bottom of the ocean on Atlantis Submarines! You'll be the envy of your friends when you share your tales of this exciting adventure! Marvel at the beautiful sunset while sipping a glass of champagne as you sail along the exclusive west coast aboard Action Charters Catamaran Cruises. Enjoy an evening of romance and fine dining at one of Barbados' finest restaurants. Most of these restaurants provide live entertainment to complement the mood of the evening.